A few characters by Timm always seem spot-on. Or maybe all the women he draws are just spot-on? In any case, he really nails the character of Crystal in these two pin-ups. The above has Crystal standing in Attilan, the home of the Inhumans. The costume has these real subtle elements, like the belt buckle around her (tiny) waist, the flared gloves and boots. 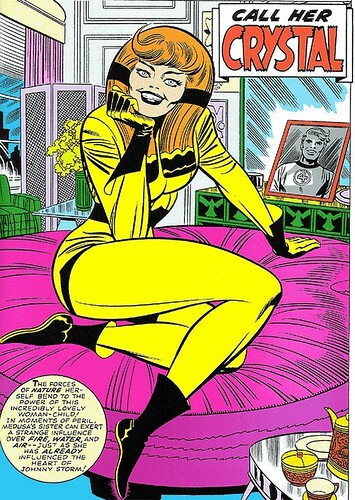 I always like Crystal from the first 140 issues of the Fantastic Four. She was Johnny Storm’s first love, and the one that hurt him the most when that slime ball Quicksilver stole her away. 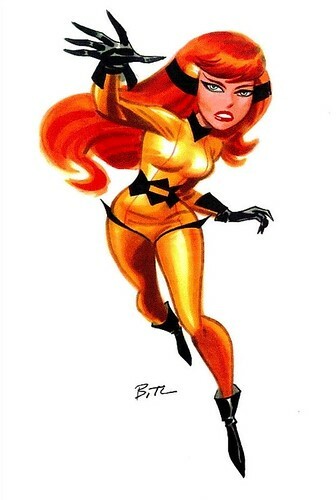 She had various guest appearances over the years, was an Avenger for a brief period of time. Lately she was married to Ronan the Accuser of all people. 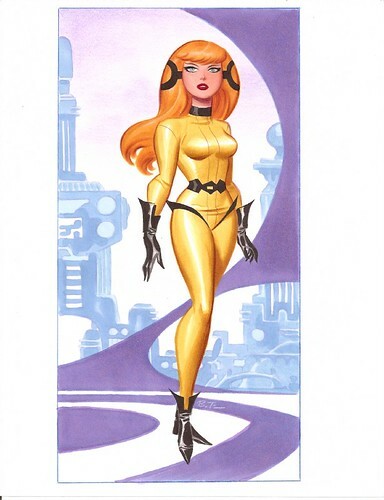 Jack Kirby designed Crystal’s look and costume, of course, but where did this costume actually appear in the FF? I searched quickly through a few comics and could only come up with this pin-up from Fantastic Four Annual #5 in 1967. In other FF appearances, I found Crystal wearing a variety of outfits, and when she replaced Sue briefly in the latter stage of Kirby’s run, Crystal put on the traditional blue FF outfit. At any rate, it is a great costume. I imagine Kirby created this in less than an hour and did it all based on imagination and instinct. Nuff Said!